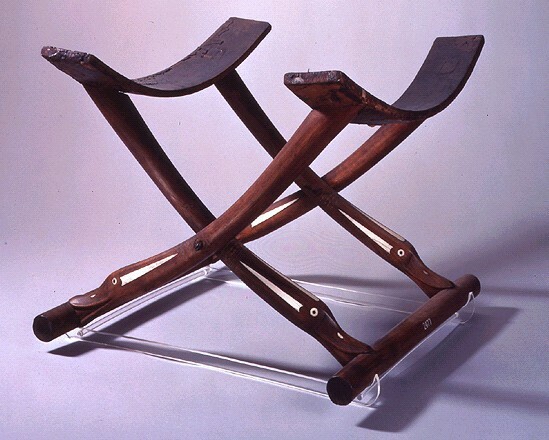 The squat folding stool is a piece of furniture known from tomb-paintings in Egypt from before the New Kingdom. This beautifully made example is of a type which appears to have been restricted to the 18th and 19th Dynasties, characterized by legs terminating in duck heads. It is composed of three elements. The well cut and finished base rails are cylindrical and without further decoration. The folding legs are the most attractive part of the stool, for they each terminate in a head of a duck or goose. These heads are carefully carved, with the eyes and nostrils inlaid with ivory; there are also long thin triangular pieces of ivory inlaid into the neck of the bird.